Shelby County - This is where I write stuff. On the square in the center of Shelbyville, stands a statue of a young man holding aloft two bear cubs. A plaque on the fence surrounding the statue reads: Charles Major, native son, Author of The Bears of Blue River. Major was actually born in Indianapolis, but moved to Shelbyville with his family when he was thirteen. The Bears of Blue River, one of his better known novels, is set in the early 19th century in Shelby County on the banks of the Big Blue River. Upon his high school graduation in 1872, Charles Major studied law at the University of Michigan, where he received his degree in 1875. He was admitted to the Indiana bar just a few years later in 1877, but his life as a lawyer was always secondary to his life as a novelist. Besides many other novels, he also wrote three juvenile classics of Indiana literature, The Bears of Blue River, A Forest Hearth, and Uncle Tom Andy Bill: A Story of Bears and Indian Treasure. These three novels are all set in Indiana, near Major’s home town of Shelbyville, and tell the tale of Balser Brent, a boy with an adventurous streak. Each novel examines the pioneer spirit that that dominated the 19th century, and the rise of Indiana’s farming culture, all wrapped up in a trio of thrilling adventure stories. The Bears of Blue River saw a film release in 2006. Shelby County, Indiana is part of the area surrounding central Indiana that has beautiful rolling hills and dells of Indiana with towns of similar sizes, between 5,000 and 20,000 inhabitants, and represent true middle America. Shelby County covers 412.6 square miles and has total population of 44,114 (2006). 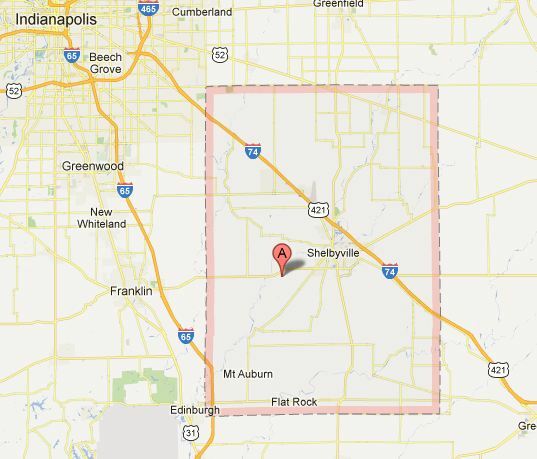 As the county seat, Shelbyville is located roughly 22 miles southeast of Indianapolis. Shelbyville is the largest city in the county and has a population of 18,063.